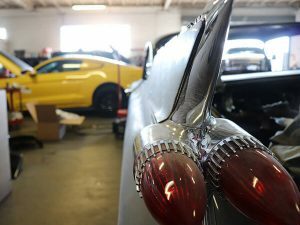 A full restoration usually entails taking a car apart and restoring each piece and system back to its original or optimal condition. This can prevent future problems, as well as solve any minor issues before they become major ones. At Autobahn Collision Center in Torrance, we would love to restore the body, paint, and the mechanics of your classic vehicle. With the body, we disassemble and catalog all of the pieces on the vehicle. From there, we can strip the vehicle and repair any rust. From replacing the trim to repainting, to smoothing out any waves and dents, we are ready to make your vehicle look like it just rolled off the showroom floor. When it comes to the paint, we begin by completing a thorough evaluation to see exactly what the vehicle needs in order to look the way you want. Sometimes, we are able to repaint certain areas and other cases call for a complete repaint. When we need to repaint, we paint the entire vehicle, including all jambs, under the hood, and the under deck lid. Once we are pleased with the results, we buff the vehicle and get it back to you in stunning condition. Finally, we can assist with any mechanical systems that may need work. From upgrading the brakes and steering to rebuilding the engine, our team is here and ready to help you recreate your dream car. Contact us today or stop by either of our locations for more information about our restoration process. With more than 20 years in business, we have helped bring cars that were in extremely rough shape back to life. Check out our gallery page to see some examples of some of the projects we have completed. No matter what project is waiting in your garage, we know that we can bring it to life.